Over the last decade, the agricultural industry of Europe has witnessed a massive transformation owing to the increasing demand for sustainable farming practices. Rising urbanization and high-income growth, especially in the East European countries, have resulted in growing concerns of food security across the region. Various agricultural start-ups and technology innovators are developing numerous sustainable farming systems. With the rapid employment of advanced farming solutions, farmers can enhance production yield by increasing inputs and efficient management of farm enterprises. The advent of innovative farm management techniques has resulted in the accumulation of enormous data. Moreover, there has been an increasing need for complete farm management software to automate and monitor various farm activities. Farm management software and services include the use of IoT and big data analytics to solve key challenges such as resource management, decision-making, and record-keeping. 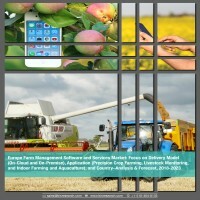 This market research study offers a wide perspective of the different types of delivery models and applications pertaining to the Europe farm management software and services and analyzes its impact on the farming sector of the region by providing critical insights into the direction of its future expansion. The research is based on extensive primary interviews (in-house experts, industry leaders, and market players) and secondary research (a host of paid and unpaid databases), along with the analytical tools that have been used to build the forecast and the predictive models. • What is the Europe farm management software and services market size in terms of revenue along with the growth rate during the forecast period 2018-2023? • What is the revenue generated by farm management software and services for different applications in Europe? • What are the major types of delivery models in the farm management software and services market in Europe? • How attractive is the market for different stakeholders present in the industry by analyzing the futuristic scenario of the Europe farm management software and services market? • What are the major challenges inhibiting the growth of the Europe farm management software and services market? • What kind of new strategies have been adopted by the existing market players to expand their market position in the industry? • What is the competitive strength of the key players in the Europe farm management software and services market by analyzing their recent developments, product offerings, and country presence? The report further includes a thorough analysis of the impact of the five major forces to understand the overall attractiveness of the industry. The report also focuses on the key developments and investments made in the Europe farm management software and services market by the players and government. Further, the report includes an exhaustive country analysis of the European countries including Germany, France, the U.K., Italy, the Netherlands, Spain, Russia, U.K., Poland, Austria, Czech Republic, and the Rest-of-Europe. Each country details the individual drivering and restraining factors for the farm managemement software and services market in addition to the key players from that region. Deere & Company, 365FarmNet GmbH, Agrivi, Agroptima S.L., Hexagon Agriculture, Trimble Inc., DeLaval, Boumatic LLC, GEA Group, Fullwood Ltd., Lely S.a.r.l, Motorleaf Inc., Infarm, Lettus Grow Ltd, AKVA Group, and Integrated Information Systems S.A. are some of the prominent players in the Europe farm management software and services market. 7.16 Integrated Information Systems S.A.
Table 6.9 Farm Management Software by Key Companies in the U.K.
Augmented demand for high-quality yields and changes in farming structures across Europe have promoted the development of innovative business models for farm management. The demand for agricultural output in Europe is expected to increase heavily. However, the acreage cultivated in the region will rise only marginally. Finding ways to cater to the ever-increasing demand for food from the limited farmlands requires solutions that would help improve the productivity of the farm. To address the escalating demand for food from the limited farmlands and labor, the established agriculture machinery developers and technology vendors are introducing innovative solutions to the farming arena. These solutions are focused on helping farmers close the supply demand gap, by ensuring high yields, profitability, and protection of the environment. Use of such advanced solutions allows farmers to acquire enormous amount of site-specific data that can be applied to improve decision-making. Farm management software and services assist in managing all the farm activities, so that the farm yields better results. Farm management software ensures the utilization of each acre of a farm to its maximum potential. This software also helps in ensuring that the application of fertilizer or crop protection chemicals and the irrigation of fields are effective and in precise quantities. Moreover, farm management software solutions also find applications in the management of livestock and aquaculture and in indoor farming control systems. The market for such solutions is expected to progress at a substantial rate due to the ever-growing affinity for more convenient cloud storage, which has been widely incorporated in the farm management software. Government bodies across the region have also realized the need and importance of these software and, thus, their initiatives to promote farming and agriculture further drive the growth of the market. The increasing farm size in most of the regions further promotes the growth of the farm management software and services market, as the need of software is more in larger farms where more data is generated, and its collection and analysis are more complicated. The concept of farm management software and services market revolves around the type of delivery model. Delivery model refers to the method by which a company provides its services to the customers. Farm management services can be provided with a server located in the farm premises or outside. If the server is located within the farm premises, it is termed as on-premise delivery, while if the server is not within the premises, it is termed as cloud-based delivery. On premise delivery model was most commonly used in early 2000s, but the rise of web and the easy access to data has made cloud-based delivery model more common. Farm management software and services have applications covering most of the farming types including precision crop farming, livestock monitoring and management, indoor farming, aquaculture, and others (forestry and orchids). Major applications include yield monitoring, crop scouting, weather monitoring and forecasting, herd management, indoor climate control, and fish tracking, among others. A dominant market share in the European nation is contributed by Germany, U.K., and France and is expected to continue during the forecast years. However, of late, there has been an increasing optimism regarding the Eastern European markets of Poland, Czech Republic, and Austria. The Common Agriculture Policy (CAP) has played a significant role in changing the scenario of the agricultural sector in Europe. Germany is expected to dominate the regional farm management software and services market in the year 2018. The leading companies in the farm management software and services market have their headquarters in European countries. These include Agrivi (U.K.), Datalogisk A/S (Denmark), Agrovision B.V. (Netherlands), and Abacus Agriculture (U.K.), among others. The competitive landscape for the farm management software and services market demonstrates an inclination toward companies adopting strategies such as product launch and development and partnerships and collaborations. The major established players in the market are focusing on product launches and developments to introduce new forms of innovations. Trimble Navigation, Iteris Inc., AgJunction, Ag Leader, The Climate Corporation, Hexagon Agriculture, Raven Industries, and Topcon Positioning Systems were the most prominent names that surfaced in 2017 in this regard. These companies launched various new products and brought new developments to their existing products to expand their share in the market. The need for more R&D and appropriate regulatory environment is a prerequisite for the sustained growth of this market. Various governments and private research institutes and regulatory bodies and associations are putting in substantial efforts to identify how farm management software can be important for required food production. The need for sophisticated farming techniques is necessary to fulfill the increasing demand for food. Farm management software not only makes farming more productive but also helps in attracting the youth toward farming and agriculture.